It’s a race to catch the light and color now. We found magic in Shrewsbury last week. Looking at the world through the eyes of an artist is easy in autumn. Appreciation, gratitude, wonder, and joy are all magnified, bringing beauty into focus. A good perspective to aim for all year. 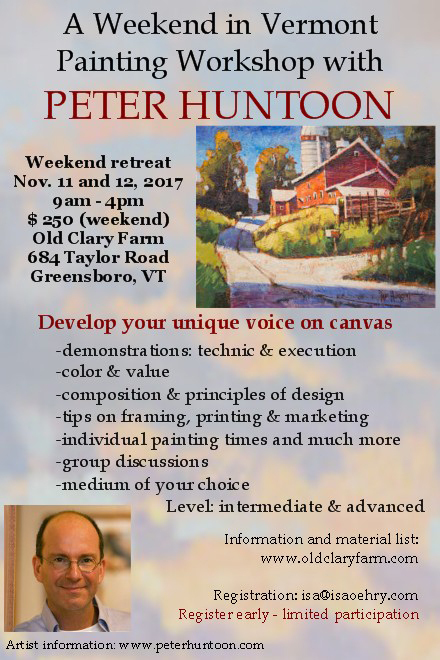 I have two Vermont Art workshops scheduled for 2017 and they’re coming up soon! If you’ve been wanting to take a class with me, this is your opportunity. in the beauty that she weaves. as she whispers through the pine. 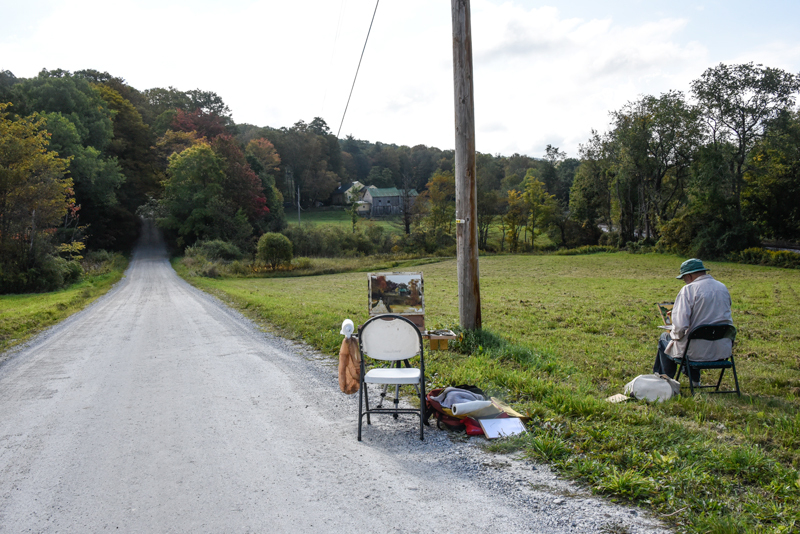 a painted prayer, a valley deep. I wish I could stop time this time of year, Karen. Alas, we just have to savor it while it lasts. can you provide description – size etc? Hi Nelida, I always provide size and media description for the auction piece just to the bottom right of the image, as above. In this case, it’s my usual 12X16 size, oil on linen panel. Just let me know if you have any other questions. Tx! I love this scene! Many of your magnificent paintings make me think past the scene. What other beauty must be just down that road? There is still the warmth of the Autumnal season within the cooler tones. Just lovely. 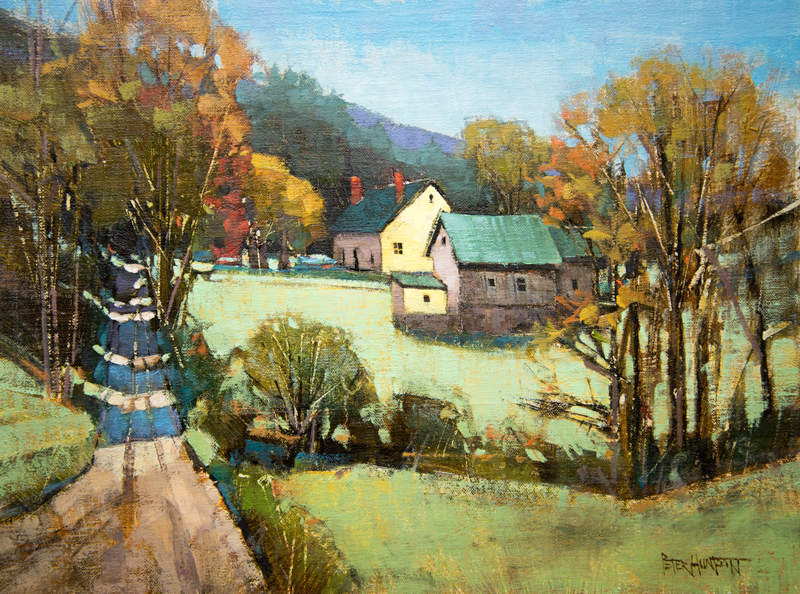 The vibrant blue shadows along the road complement autumn’s yellows and golds, while the darker colors in the painting create an interesting internal framework that leads the eye up, over, down, and around in gentle movement of grace and beauty. Thanks Brian, I did choose to “push” the blue shadows a bit, but I do love the cool zing against the contrasting warmth. Peter, I received my print and I love it. I also enjoyed your nice note. Your art work is enchanting. Glad you like it Linda, thanks so much for your kind support! I love your painting, and its promise of an autumn which seems to be just budding. I’m particularly drawn to the road which leaves me wondering what’s just beyond? What beauty is left to be painted? Thank you for sharing your talent with us! My pleasure Shelley, thank you. There is plenty more beauty to be painted for sure. I wish I could capture it all. More and more I contemplate current affairs. So much suffering. I always come to the same humble action plan; Keep doing what I’m doing. If I can send a little beauty and “goodness” into the roiling stream each week, that is something. Amazing blue shadows! They are pushing eye catchers between the soft colors. In the background the blue roof is balancing the sharp contrast. Such a fine composition.